Everything Old is New Again — Welcome 2012! Before we start blogging about eating right, juicing, going vegetarian and gasp…veganism, we thought we needed to share a little story about our holidays. We spent the season with old friends and new friends, chatted with lots of family members and shared the first Christmas with the newest member, our grand niece Jayleigh. Mostly though, we spent a lot of time driving. We traveled to three states, Utah, Idaho, and Wyoming and trekked 1500 miles on the rental car with an average of more than 2 hours of highway driving a day, and even though it sounds like we’re complaining about the driving time a little, it was all worth it. Aside from celebrating Christmas with family and New Year’s Eve with friends, we also grieved the death of Steve’s grandfather at his funeral, reunited with college friends for dinner and drinks, congratulated Steve’s father on retiring after 47 years of working (at the same place), and celebrated the weddings (same couple, two ceremonies) of one of our dearest friends, Kathy, to one of the nicest guys ever, Michael. For anyone who doesn’t believe in true love, you must hear their story. Kathy told us the story of how they met, but given the time that had passed since the telling of the story and our terrible memories, we had forgotten it. Kathy’s mother reminded us of their story right after they exchanged their vows for the first time (more on that in a minute). The story goes something like this: when they were in high school, Kathy’s junior year and Michael’s sophomore year, both of them were on the yearbook committee. There they spent many hours in a darkroom developing pictures. Both of them were shy, awkward kids with raging hormones and the setting was perfect for a little teenage canoodling. Alas, nothing shocking happened in the darkroom and there was very little said between them, but both wished and hoped something would happen. Disappointingly, nothing ever did. Then in Kathy’s senior year her family moved away to the San Francisco Bay Area, leaving Michael in Green River, Wyoming regretting not having the nerve to kiss this beautiful young woman. She would be the one that got away. Years passed and life continued as it inevitably does. Marriages came and went for both of them resulting in three very wonderful boys, now men. Kathy has two beautiful sons and Michael has one. Then one day, through the magic of facebook, they reconnected, befriending each other and wondering if they shared the same memories and feelings. The feelings were definitely there. They met in person and haven’t been apart since, emotionally. The evidence of their romance turns up in photo after photo of a giddy, giggling duo. One of their wedding guests commented on a photo of the couple, saying it was the first picture she had seen of the pair where they weren’t embraced in a passionate kiss. We were aware that Kathy and Michael were engaged but the actual date was up in the air. Then in mid December we received an email that the date had been chosen – January 1, 2012 – just days away. No question about it, we had to be there. Then on a visit with Kathy only days before the big day we were informed that there would be, in fact, two weddings – one on January 1in Ogden, Utah (Kathy’s home), and the other in Green River, Wyoming (Michael’s home) on December 31, 2011. Yup, two weddings in two days. That wasn’t all. We were to be honored by a request from the father of the bride to bake the wedding cake. With so many requests and so little time, we had to think about the trip to Green River and more importantly, the baking of the cake. Within minutes of discussing it together we knew both things were possible. We could attend both weddings and bake the wedding cake for the Ogden wedding. We sent the good word and the rest is now history. The cake decorations are as simple as syrup, berries, and jam. When we married three years ago, we didn’t have a cake on our wedding day. The frugal one, Jason, decide that a $2 cutting fee per person was too much to pay the restaurant for a cake he intended to bake himself. 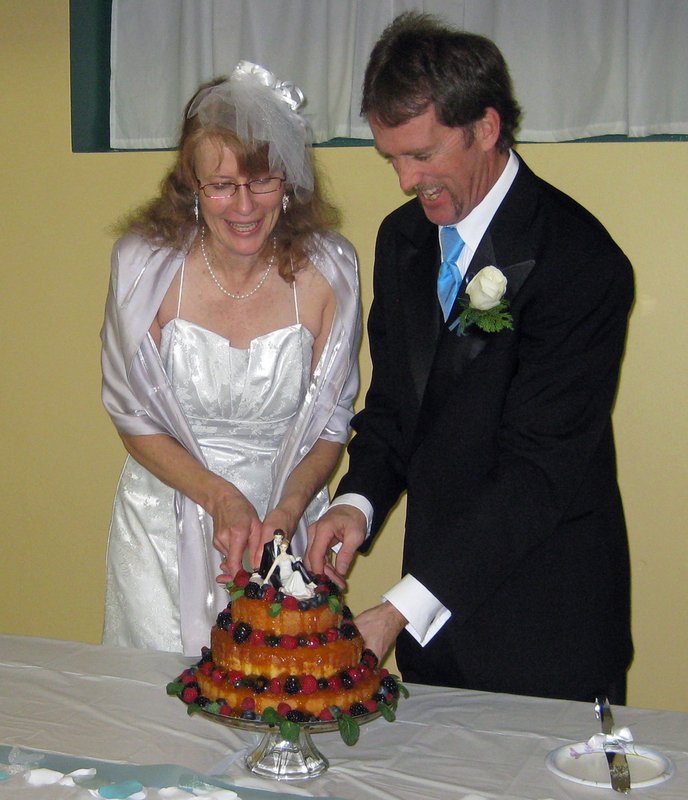 However, we did have our wedding cake the day after at a brunch we hosted with our family and friends. The cake that Jason baked was an almond cake from Jacques Pépin’s cookbook Fast Food My Way. In the book, Chef Pépin discusses making this specific cake for his daughter, Claudine, for her wedding day. The picture in the book is probably the most beautiful and easy wedding cake either one of us has seen. Decorated with fresh berries and glazed with a simple apricot jam, the wedding cake is something that even a novice cake baker could create with little effort. With the pressure on for baking the cake we went into action. We were lucky to find the most exotic ingredient on the list, almond paste, at a Walmart, along with the needed baking pans. The recipe we found on-line at KQED thanks to our iPhones and gradually we were able to find everything else we needed. One thing about these cakes is that they seem to only get better as they age, so we baked the cakes a few days before the wedding and kept them refrigerated. There were two other ingredients one would think would be easy to find in almost any city, but in the middle part of the country it can be almost impossible to find in any store a mini bottle of booze and a tub of crème fraiche. Due to Utah’s ridiculous liquor laws, mini bottles are not for sale in the state. We didn’t need much alcohol for the simple syrup so buying a bottle of Grand Marnier (our original choice) seemed like too much. Since we would be in Wyoming for the first wedding we were hoping to find it there, at the very least we knew we could find a mini bottle of something. Growing up in Utah and Idaho, Wyoming was notorious for three things; 6 percent beer (it’s 3.2 in Utah and Idaho), drive up windows at liquor stores, and fireworks. (Insert your most obvious joke here.) We couldn’t find the Grand Marnier so we settled on a mini bottle of brandy. The crème fraiche we found at the Whole Foods in Salt Lake City, where we spent NYE after driving back from Green River for the first wedding. A strainer for the triple berry coulis was the only piece of equipment we didn’t have. Steve has been requesting a cone shaped professional sieve (Chinoise) for years. Since we were staying at the Hyatt Place near the Gateway mall in SLC on NYE, and the mall had a Sur la Table, we thought now was the perfect time to splurge and buy the strainer. We now had everything we needed to finish the cake. After a night of mellow partying in SLC on NYE (a mediocre and expensive martini that barely wet the glass [stupid Utah liquor laws], a shared bottle of wine between four friends, and a glass of sparkling wine) we traveled back to Ogden on the first to pick up the cakes, make the triple berry coulis, and get to the church with enough time to assemble the cake. It all went smoothly. The most difficult thing we had to deal with were the berries rolling off the cake layers, but once the apricot jam glazed the cakes the berries were set in place. The second wedding ceremony was just as beautiful as the first, and both the bride and groom seemed just as nervous – and joyous. It was a perfect pair of weddings for this sweet couple. And while the cake tasted just as good as it looked, it was the happy couple that took the center stage, as it should be. We want to congratulate Kathy and Michael on pulling together two beautiful weddings with only weeks to do it and the help of plenty of family and friends. Cheers to both of them. Here’s wishing them 77 to the power of 10, multiplied by 2, years of happy and loving marriage, plus a day. Preparation Heat the oven to 350 degrees. Put the almond paste, sugar, butter, and vanilla in a food processor and process for about 10 seconds. Add the eggs, milk, and salt and process for 5 seconds. Add the flour and the baking powder and process for another 5 to 10 seconds, or until smooth. Butter an 8-inch round cake pan (2 inches deep) with the reserved 1/2 teaspoon butter. Pour the cake batter into the pan and bake for 45 minutes. Cool on a rack. At serving time, place the cake on a serving platter. Using a spoon or pastry brush, moisten the cake with the syrup. Scatter the berries on top of and around the cake. Spoon on the diluted apricot jam and garnish with the mint leaves. Serve with the crème fraîche or sour cream. You can make the cake early in the day. Or make several cakes and wrap them well for the freezer. Defrost, still in their wrappings, in the refrigerator. To make a large cake for a special occasion–birthday, wedding, or the like–triple the recipe (we actually quadrupled the recipe) and bake in different-size cake pans, perhaps 12 inch, 8 inch, and 5 inch. Brush the largest layer with one third of the syrup, center the second largest layer on top and brush with one third of the syrup, and top with the smallest cake layer. Brush with the remaining syrup and scatter the berries over the layers. Spoon the diluted apricot jam over the berries and cake and garnish with the mint leaves and/or edible flowers. Serve with crème fraîche or sour cream.